McKai was placed 1st Excellent and became Beste Male, CAC, BOS and Best Veteran. 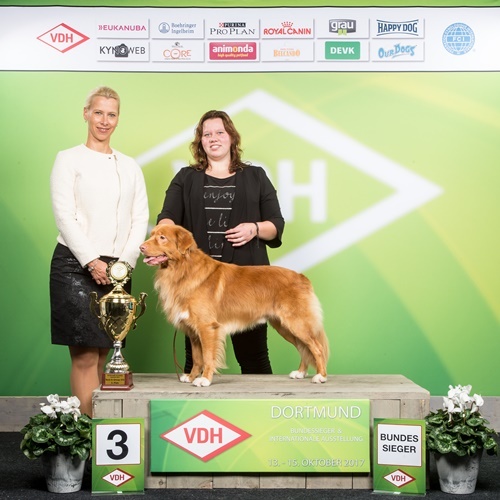 He is now a Dutch Veteran Champion! 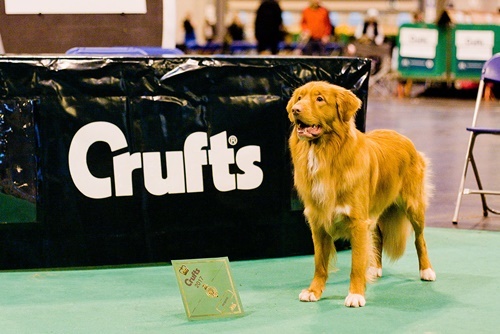 7 March 2019 Crufts 2019! Huey was shortlisted (best 6) in a very strong open class. Seef, McKai’s son, had his debut together with his owner Kirsten. They were great together! Even though they didn’t get placed, I am very proud of them. McKai and Huey also received their entrance tickets for Crufts on March 7th. 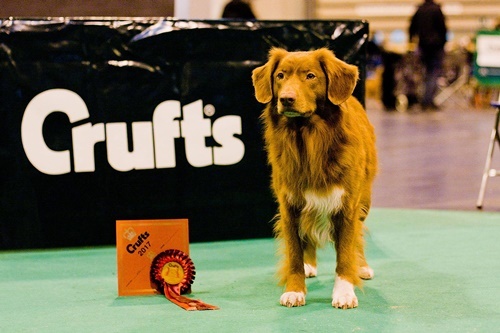 Really looking forward going to Crufts again! 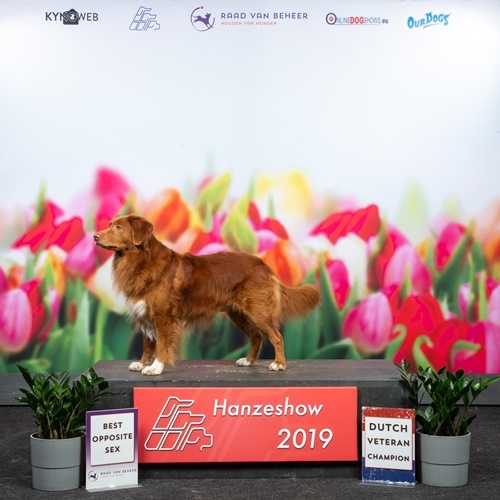 13 January '19 Huey was selected at the Dog of the Year show as one of the 6 best dogs in breed group 8 by judge Mr Hans Stigt. The judge spoke very highly of him which made me even more proud. Although, he didn't win, the judge said Huey was one of his favorites in this group. This weekend both girls did an amazing job delivering the puppies. Maya gave birth to seven healthy puppies on Thursday November 22nd. Five boys and two girls. Fenja gave birth to four big and healthy puppies on Saturday November 24th. One boy and three girls. Both mums and their puppies are doing great. 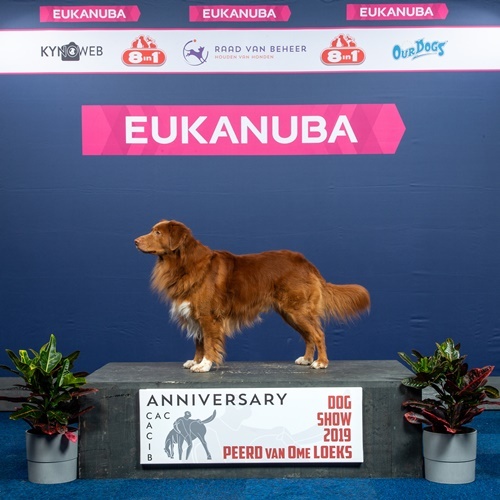 We are very proud and would like to thank Mirko and Chiara from kennel Di Casa Tollers in Italy and Grete Munch from kennel Mariendals Red Nose in Denmark for using our boy Huey. We are looking forward seeing these puppies grow up. 24 & 25 Sept. Huey had a date with his Italian girl Maya from kennel Di Casa Tollers. Now fingers crossed. 21 & 22 Sept. Huey mated to the lovely Fenja from kennel Mariendals Red Nose in Denmark. 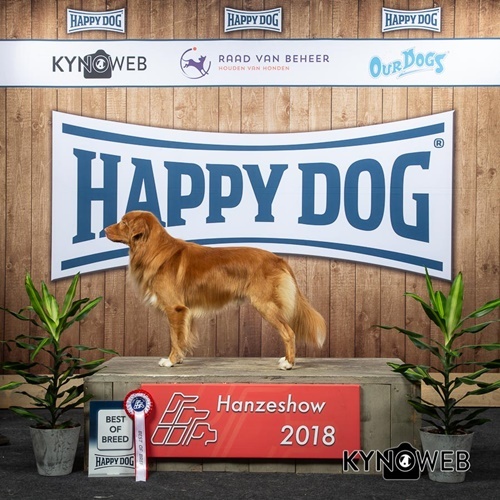 24 June 2018 IDS Zwolle: Huey 1st place Excellent, Best Male, CAC, CACIB and Best of Breed. He is now also an International Show Champion (CIE). kennel l'Abbaye des Terres de Flandre in France. Male, CAC and Best of Breed! 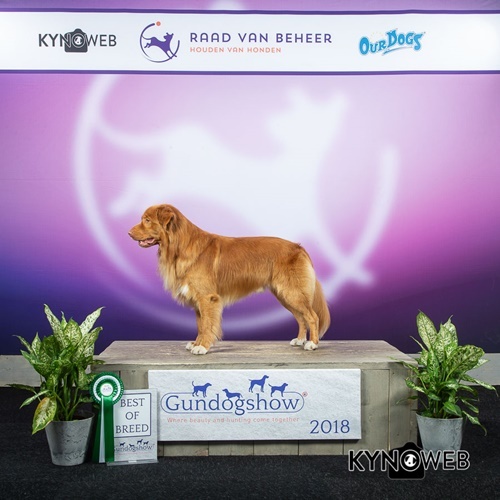 Best Male, CAC, Best of Breed and Club Winner 2018! He now also has enough points for his Dutch Championship title! 25&26 Nov '17 McKai participated in a Detection Masterclass by Wesley Visser of Scent Imprent for Dogs. McKai worked very well and had some very nice searches both days. Our teamwork and McKai's good work led to a new certificate: SIFD level 5! We are very proud of our red friend! 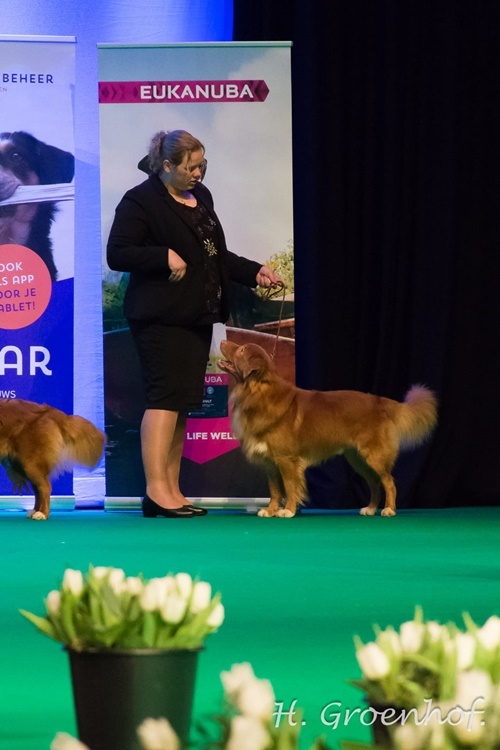 4 & 5 Nov.'17 International Dog Show Herning, Denmark. Huey was entered on both days in Open class and he did great. Saturday and Sunday 1st place Excellent with CK, Best Male, Best of Breed, CAC and CACIB. On Sunday he also won the title Danish Winner 2017! 1ste place Excellent, Beste Male, Best of Breed, Bundessieger 2017, CAC and CACIB. In the main ring Huey was placed 3rd in Group 8!!!! (BIG3). Huey got a 1st place Excellent in Intermediate class, Best Male, Beste of Breed AND Best in Show!! We are so very proud of this amazing result!! McKai 1st place Excellent in Working Class, CAC, CACIB, Best Male, Best of Breed and he got the title VDH- Frühjahrssieger 2017!! McKai 1st place in special working class!!! We are soooo very proud of our two boys!! We had an amazing time with friends!! 9 August 2015 Wat a great day we had, yesterday!! We are totally over the moon! We had a KNJV Hunting test in Delfzijl. Both Kay-lo and McKai were entered. Kay-lo got his first KNJV A certificate!!! We are soooo proud! Lieuwe and Kay-lo worked so hard for this. 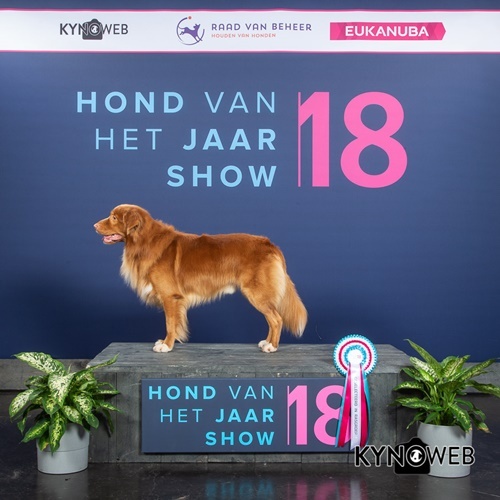 There are not a lot of tollers with a KNJV Hunting A certificate, so that makes this result even more special! Kay-lo got 83/100 points and a 3rd place. 18 dogs tried to get the same certificate, only three passed. We are soooooo proud !! !